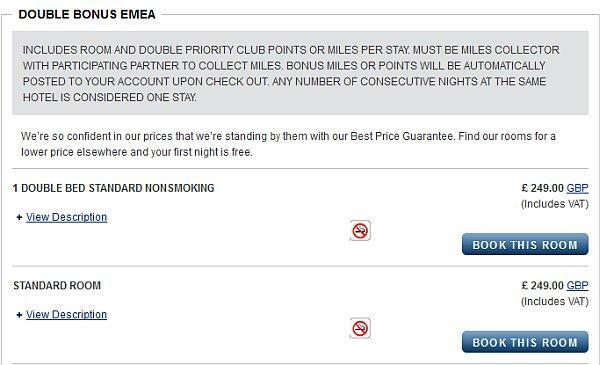 Priority Club has a new offer for double points for stays in participating properties in London that are booked by April 30 for stays until June 30, 2013. You can access Priority Club’s website for this offer here . There is discrepancy between the title of this promotions and the terms and conditions. One would hope that IHG would have more competent people designing these. The terms and conditions are referring to 1000 bonus points per night and the title of the promotion for double points. The rate code for this promotion is IKDB2. 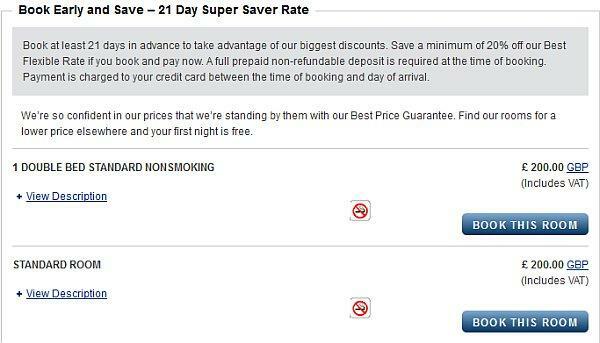 You need to pull up this double points rate separate from other discount rates. The IHG’s website won’t show them all at the same time. Seems that the double points rate is the same as the Best Flexible Rate. As you need to make your booking in advance to be eligible for the double points, it doesn’t make sense to book this rate plan unless your plans are not firm. You end up paying dearly for points. Must be a Priority Club Rewards member or enroll prior to stay. Only available at participating InterContinental Hotels Group (InterContinental®, Crowne Plaza®, Hotel Indigo®, Holiday Inn®, Holiday Inn Express®, Staybridge Suites®) hotels in London, England. 1,000 bonus points will be awarded for each night, with the exception of Staybridge Suites where 1,000 bonus points will be awarded for each stay. A Stay is defined as one night or consecutive nights at the same hotel, regardless of frequency of check-in/check-out. Offer valid until the 30th April 2013 for stays from the 22nd of March 2013 until the 30th of June 2013. Rates are limited and subject to availability. Offer valid on new bookings only, not applicable to groups and cannot be used in conjunction with any other offers or special promotions. Bonus points or miles will be awarded upon the terms of the Bonus Point Package and completion of stay. Only one member per room will be awarded the applicable bonus points or miles. You must be a miles collector with a preferred earning alliance within your Priority Club member account in order to collect miles for staying at InterContinental Hotels Group properties. *Points will be converted into airline miles upon completion of stay, 1,000 points = 200 miles. Points will be converted into AIR MILES®† reward miles upon completion of stay, 1,000 points = 25 reward miles. No retroactive points or miles will be awarded for nights stayed prior to enrollment. Blackout dates may apply. Rates are per room, per night, and extra person charges and rollaway bed charges may apply. Other restrictions may apply. Rates do not include taxes, gratuities, or incidental charges, including food and beverages. A stay is one or more consecutive nights at the same hotel regardless of frequency of check-in/checkout. Subject to standard Priority Club program terms and conditions.